Pro Kabaddi League 2018 action continued as the action moved from the South of India to North India in the homeland of the sport, Sonepat in the state of Haryana. The second leg of the competition will take place at the Motilal Nehru School of Sport with the home side Haryana Steelers hosting the various opponents in the Sonepat leg of the league. The UP Yoddha faced their South Indian counterparts Telugu Titans in the first match of the day in what promised to be an all-out raiding battle. Both the sides boasted a bunch of strong raiders with the likes of Rahul Chaudhari, Rishank Devadiga, Shrikant Jadhav, Nilesh Salunke and Prashant Kumar Rai on the mat. UP Yoddha came into this match on the back of a closely fought loss against the Patna Pirates in a match that saw the result go down to the wire till the last raid as Shrikant Jadhav almost clinched the win for the Yoddhas with a Super Raid but fell short of the midline. The defence had a decent outing as both Sagar Krishna and Nitesh Kumar managed to get a few tackle points on the board. 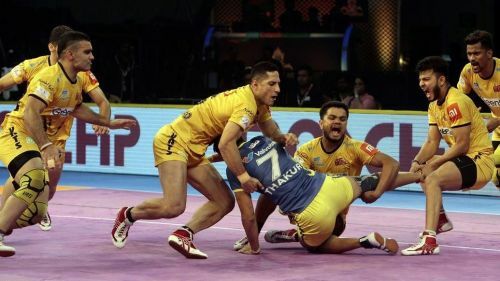 Telugu Titans had a strong outing in their first match of the season against the Tamil Thalaivas when they defeated the home side at the JLN Indoor Stadium in Chennai. Rahul Chaudhari and Nilesh Salunke had a field day against the Thalaivas' defence with their smooth raiding. An added positive for the Titans was the form of Mohsen Maghsoudlou who dazzled on the mat scoring both in attack as well as defence for the team. The defence was manned by the captain Vishal Bhardwaj along with the support of Iranian powerhouse Abozar Mighani at the right corner. Telugu Titans put on a strong all-around show to win 34-29 over the UP Yoddha in a performance that saw both the team's defenders play well. The captain of the Telugu Titans was at his best from the left corner as he executed a couple of great ankle holds on the UP Yoddha raiders. Even though Anil Kumar got only one tackle point to his credit, he was involved in a lot of assists in the tackles executed by the defenders and played his part for the Telugu Titans. After a quiet first match of the season, the Iranian defender finally came into his element has he was dangerous on the right corner and combined well with Vishal Bhardwaj. He managed to get the High 5 tonight and was the best defender for the Titans. The Iranian all-rounder had a quiet first half of the match but came into his own in the second half and did well in the defence. He even scored a bonus point which highlighted his utlity for the team on the mat. The all-rounder had a decent outing tonight after his incredible performance in the first match. He was used as the third raider tonight by the Telugu Titans and was helpful with his effort in the defensive side of things as well. The Maharashtra man was on song in the first half of the match as he kept racking up the bonus points and did well to support the main raider Rahul Chaudhari with his contribution. He was always a danger man for the Titans whenever Chaudhari was off the mat and performed with conviction. The star man for the Telugu Titans displayed his usual lethal raiding skills for the Titans as he raided from both sides of the mat. He almost scored his Super 10 on the night as he finished at 9 raid points again.